I tried to get more of a ‘joiner’ effect, but Hugin’s just too good at stitching. 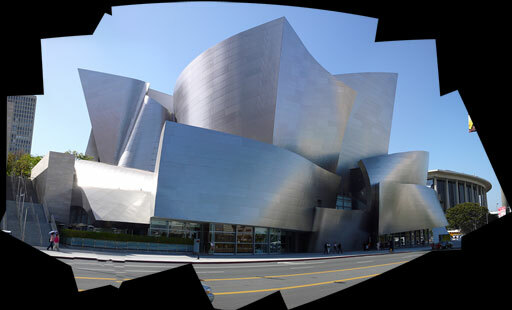 Still, it’s angular enough for the Disney Opera House. The original is approximately 90 megapixels. I’ve been working with Hugin for a while, but found its colour matching when stitching less than perfect. I just built and tried enblend, which promises much better quality stitching — at the cost of some serious CPU usage. The above is 8 images, taken when standing at the near the bridge over the Ottawa River. It was handheld, with just a basic Nikon 2MP digicam in auto-everything mode. Can you see the joins? Hugin just got a load easier to build on Gentoo. You no longer have to jump through hoops of tweaking source to get things to compile. I like the package a lot, and I look forward to using it with my Kaidan panoramic tripod head. The above may not be the most remarkable panoramic picture ever — the back of a suburban hockey rink — but it’s the first image I’ve managed to stitch with hugin, a front-end to Helmut Dersch’s panotools. It was a bit of a fight to get it working with Gentoo linux.